equity. Notice in Figure 17.7 that we have plotted the various capital costs against the debt-equity ratio, D/E. Figure 17.7 is much the same as Figure 17.5 except that we have added a new line for the WACC. This line, which corresponds to the static theory, declines at first. 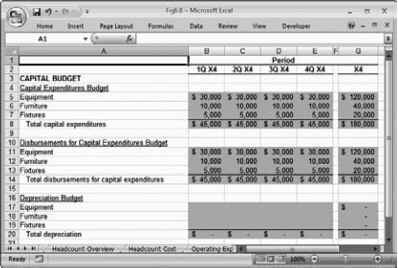 This occurs because the aftertax cost of debt is cheaper than equity, so, at least initially, the overall cost of capital declines. At some point, the cost of debt begins to rise, and the fact that debt is cheaper than equity is more than offset by the financial distress costs. 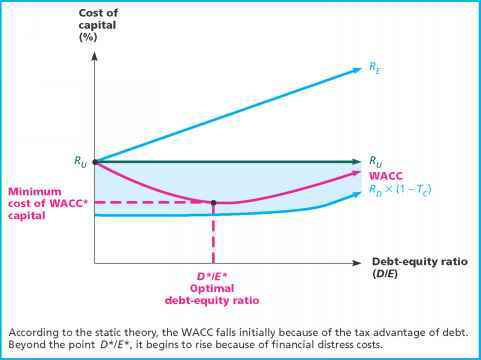 From this point, further increases in debt actually increase the WACC. As illustrated, the minimum WACC occurs at the point D*/E*, just as we described before.